It's a matter of trust (again); the dangers of artificial intelligence - and what we're doing about it; an IQ test between Google Home and Amazon Echo; going electric in China; the ad industry faces a pivotal moment; print journalism may only have another 10 years; Walmart's secret weapon against Amazon; Facebook faces its first decline ever; the case against Google; more cord cutters mean less TV ad revenue; the impact of the GDPR; ridesharing may do more harm than good; measure what matters; what you consume defines what you create; plus, the latest edition of The Difference; and more in the This Again? edition of The Full Monty from Brain+Trust Partners for the week of February 26, 2018. If you find this newsletter indispensable, then show it. It seems like we just covered this topic. Or perhaps more likely, that we never stopped covering it. I'm talking about fake news. No, not the kind you hear squawked from behind a podium or a high-profile Twitter account. The actual, deliberate and deceitful kind. From videos that spew conspiracy theories to bot accounts on Twitter to downright breach of privacy, there are a number of reasons to be wary of technology companies and the agents at play on them. And without some kind of reassurance, our level of trust is going to continue to dwindle. We need trust not only in the accounts and content on these platforms, but we need trust from these technology providers as well. They should be looking out for the public's best interest, not their own bottom line. And right now, we're at a pivotal moment where they need to step up. Swiftly and decisively. One of the top-ranked Trending videos on YouTube following the Parkland shooting in Florida was a conspiracy video claiming that one of the student protesters was an actor. Far-right media site InfoWars' YouTube account is this close to being banned, as it is behind that video. Its founder, Alex Jones, is a noted conspiracy theorist. Facebook's fake account problem is getting bigger and it was in the headlines recently, as it was part of the toolset used by 13 individuals who were indicted. And Facebook continues to face scrutiny over a VPN security app that it used to spy on users. How to fact check an article in just 30 seconds. A skill set that more of us will need. A survey of fact-checking projects around the world finds a booming business, with at least 149 dedicated initiatives. An academic paper outlines the dangers of artificial intelligence, warning that AI is a two-sided technology, with great power to improve and destroy life, from faster hacking to automated phishing, propaganda and more. And the case can be made that AI researchers should be paranoid. As Joseph Heller wrote in Catch-22: "Just because you're paranoid doesn't mean they aren't after you." ICYMI: what to expect from artificial intelligence in 2018. Amazon is putting quite a bit of faith into AI How deep learning came to power Alexa, Amazon Web Services, and nearly every other division of the company. Amazon is designing its own AI chip for use in Echo and other Alexa-powered devices, following its 2015 acquisition of chip maker Annapurna Labs. In an IQ test between Amazon Echo and Google Home, who wins? UPS is developing its own fleet of electric delivery trucks. It'll need them in the fight with Amazon. But the logistics provider has always been clever about its fleet operation, and you can bet that connected electric trucks will be smart. China’s Didi Chuxing is teaming up with 12 automakers including the Renault-Nissan-Mitsubishi alliance to build an electric-vehicle-sharing network in the world’s largest auto market. China, on the cusp again. One of the biggest headaches for makers of autonomous vehicles: keeping the vehicles clean. Dirty sensors = poor self-driving ability. Which is why winter autonomous driving is not fully developed. It's an important aspect of many things: joke telling, sales calls, and more. Timing matters. Dan Pink's new book When: The Scientific Secrets of Perfect Timing breaks this down. The CEO of the IAB, advertising's largest trade group, says that the ad industry is toast unless they make some drastic changes. It's 2018 and it still needs to happen: reinventing marketing for the mobile age. Catalyst Companies has five new models to organize internally for corporate innovation. Millennials, streamers, males, researchers and heavy downloaders are the most likely to block ads. Here's why they do it. You might be surprised. As you continue to modernize your marketing mindset, here are some go-to marketing resources from Mark Schaefer. How do you know a corporate board is effective? Look to the number of activist investors it attracts. Another reminder that it's 2018: why disclosure is essential when it comes to influencer marketing. Unless you're disclosing corporate secrets or protected IP, transparency doesn't hurt. The CEO of The New York Times thinks print journalism only has about another 10 years before it's extinct. The BBC is experimenting with in-article chat bots as a way to introduce complex subjects. It's kind of like a modern-day annotation system. An a fascinating lesson for brands that may have complex products and services. Walmart's online sales growth (via Jet.com) is slowing, there is still a geographic and demographic divide; however, the grocery segment continues to outperform. Walmart has a decided advantage in grocery retail. Walmart didn't fare as well in last week's quarterly earnings report, and its investors got spooked on the constant threat from Amazon. But Walmart has a big year of investments and 40 percent growth planned for e-commerce in 2018. Walmart’s secret weapon against Amazon? Thousands of proprietary servers that enable the company to crunch almost limitless swathes of customer data in-house. Free billion dollar idea for Walmart execs: open WWS (Walmart Web Services) to compete with AWS. Continuing its push into lifestyle retail, Walmart opened a new home shopping site for furniture and home decor. Albertson's purchased the remaining portion of Rite Aid that isn't being sold to Walgreen's. JPMorgan says that Amazon's threat to FedEx and UPS is overblown; the real entity that ought to be concerned is the US Postal Service. Bloomberg made a retro 80s-style game where you try to stop a mall going out of business: it's the American Mall Game. Are you adept enough to handle all of the competing forces and keep your empire thriving? Twitter is cracking down on automation and the use of multiple accounts. This is in the wake of questions about its system's culpability in 2016 election hacking. 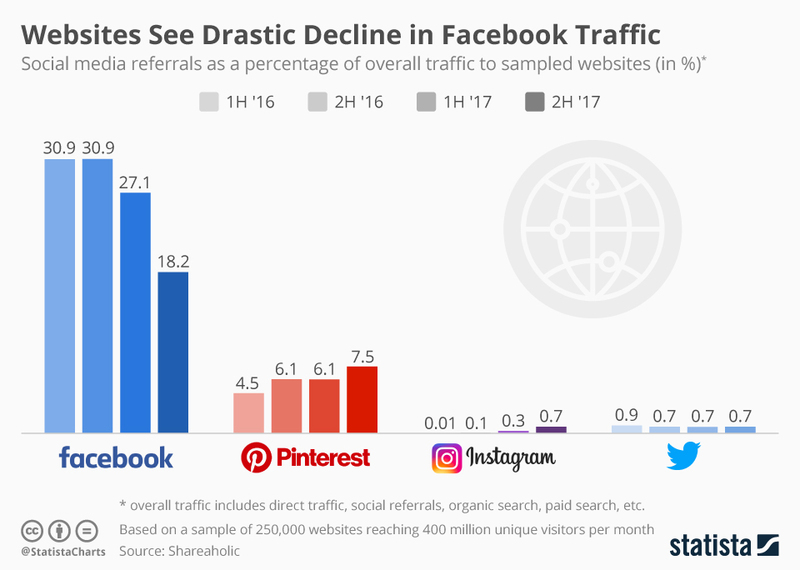 The Infinite Dial research series from Edison Research and Triton Digital has been tracking Facebook usage since 2008, and the latest report is the first time the research has found that Facebook is declining year over year. Facebook's declining reach has put the squeeze on publishers' branded content efforts. According to another study by Shareaholic, the percentage of website traffic coming from Facebook has already declined drastically in the second half of 2017. See image above for a visual representation. Ad-free subscriptions might be a prescription for what ails Facebook. Facebook Messenger will allow users to add people to already in-progress calls. Google is bringing its augmented reality (ARCore) and Google Lens tools to more devices - and giving them new tricks. Google is becoming a one-stop shop for travel planning with new Google tips and tools for travelers. Snapchat is finally giving creators analytics to see how their content is performing and some general information about who is consuming it. Hey Snap, measure this: in one tweet of dissatisfaction with the new interface, Kylie Jenner wiped out $1.3 billion of Snap's market value. What kind of a world are we living in? The declining reach of Facebook and general weariness of the platform has driven Flipboard to launch a new campaign positioning itself as an alternative that enriches people rather than draining them. Fox News is working on Fox Nation, a standalone streaming subscription service with original shows and right-leaning commentary. It is expected to debut by year's end. Or, you could just follow @realdonaldtrump on Twitter. An increase in cord-cutters is causing TV advertising revenue projections to be lowered. YouTube's CEO says the company would love to stream the NFL. The company has bid for NFL streaming rights two years in a row. It lost both times. The New York Times announced that it’s working with American Public Media to repackage its wildly successful daily news podcast The Daily as a thirty-minute broadcast for distribution to public radio stations starting in April. Pandora Premium is expanding to the web. The Spotify competitor lets its subscribers listen to specific songs and already has an app. McDonald's released The Sauce, its three-episode story behind the re-relase of its legendary Szechuan sauce (and the distribution gaffe that accompanied it). Apple's new HomePod speakers have great sound, but aren't all that smart. Program of the Week: This week's show recommendation is Business Wars. Epic battles for control of corporate America, from the infamous wars between Coke and Pepsi or McDonalds and Burger King, to small businesses across the country struggling to survive intense competition from local rivals. Do you have a program to recommend? Add yours to our Google Sheet: smonty.co/yourpodcasts. GDPR will hand a huge advantage to big American tech companies by making the web unsurfable in Europe. General Data Protection Regulation was mandated by the EU Parliament and is a case study in legislators causing harm to something that they don't understand. Veil is private browsing for the ultra-paranoid. Remember: just because you're paranoid doesn't mean they aren't after you. Google made a subtle change to image search that will make it harder to steal photos from search results. This information warfare campaign was SO. WELL. ORGANIZED. Part of me is like, "Yo, this is great digital marketing." The other part is like, "THIS IS HORRIBLE AND HOW CAN YOU TRUST ANYTHING ANYMORE??!" Airbnb launched Plus, a higher-end option to compete with hotels in 13 cities globally. These entities are inspected, professionally photographed, and include amenities. The data are in: ridesharing services like Uber and Lyft are increasingly causing traffic congestion in cities. Waymo is preparing a ridesharing service that could compete with Uber and Lyft. Facebook is removing 20 outdated, redundant ad metrics. Newspaper publishers are focused on measuring time spent and frequency in this era of loyalty. Do these metrics matter to what you're trying to accomplish with your customers? How to set goals that warn you when things go wrong, like unsubscribes or customer support requests. About half of marketers worldwide are integrating data across their tech stacks, according to a January 2018 survey from Ascend2. While a slight majority are integrating data, 43% of respondents reported that they’re merely talking about doing it. Why have so many direct-response marketers entrusted their information to third-party platforms? More brands are going direct to consumer as they attempt to control their own data. This is our mantra at Brain+Trust Partners, and we counsel clients how to do so. Read. Watch. Listen. Everything you can get your hands on. Be influenced by the things around you. You'll find that you will produce great work because you will have consumed great work. Plus, this website in this link is pure joy. And while you likely trust your guy, your first thought will rarely be your best thought. Work it through. New research says you will need this one management skill to be successful. Spoiler: it's compassion. Resist the industrialization of your profession. Treat the human, not the parts. This applies to marketers as well as to doctors. If you're doing any kind of digital transformation, it needs to start at the top. And that means more than just encouragement and verbal support. C-level executives need digital know-how and must do what they're asking their teams to do as well. 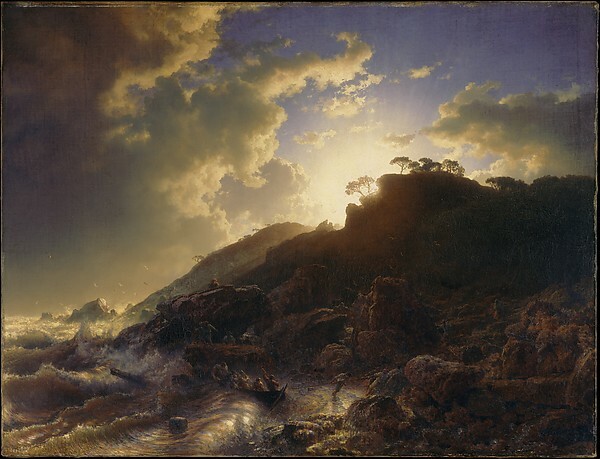 Top image credit: Sunset After a Storm on the Coast of Sicily by Andreas Achenbach, public domain.